Rebecca Pender’s daughter Hannah lives with the ultra-rare condition Inv Dup Del 8p, a genetic arrangement that affects just 80 people worldwide. She recounts the struggle to secure a diagnosis, and how the experience shaped her attitude on how we confront rare disease. Can you shed some light on the nature of Inv Dup Del 8p? Inv Dup Del 8p stands for ‘inverted duplication and deletion on the short arm of chromosome 8’. It doesn’t have an eponymous name. My daughter is literally missing some genetic material, and also has some other genetic material doubled up, on her eighth chromosome. There are only 80 people in the world that have this condition, most of whom are children. Up until the beginning of February there were only 65, and then the UNIQUE database was updated so now we now know of 80 people with the condition. Most families know each other quite well – we’re all in contact with each other and there’s a huge [sense of] community because it’s so rare that, 90% of the time, [the doctors you come across have] never heard about and don’t know anything about it. We have had to become expert patients. What are the symptoms of the condition? For Hannah, it means that she lives with epilepsy. She has quite severe epilepsy, meaning that she doesn’t have seizures very often but when she does she goes into stasis, so they last a very long time. She’s had seizures that have lasted up to two hours. She takes a long time to recover from the big seizures. She also has two cysts on the pineal region of her brain, which, as yet, are non-symptomatic. She also has a severe learning disability, so cognitively she’s about two years old and for the most part nonverbal. She has hypermobility and hypotonia. She’s double jointed as well. She can walk for short distances but she would have no spatial awareness, no sense of social propriety. That said, she has the biggest smile with the biggest dimples – but she’s very much still a baby or toddler in many senses, even though she’s six. She’ll have a lifelong learning disability. In terms of some of the other children who have her condition, they have congenital heart defects, structural brain abnormalities, autism. It’s very much a spectrum. 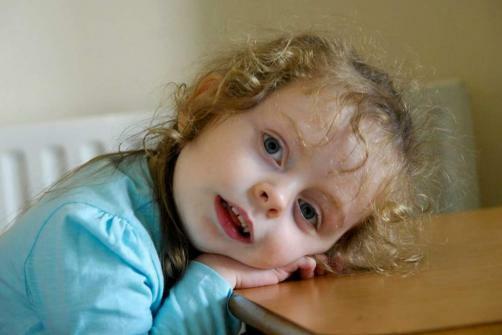 Compared to her neurologically typical peers, Hannah’s massively delayed. However, when it comes to children with this condition she’s actually on the milder end of the spectrum of those children affected. While fighting for a diagnosis, you were accused of having Munchausen’s syndrome by proxy. Could you talk about the events that led up to this? Yes. ‘I was a sleep-deprived, neurotic, first-time mother. Hannah was just lazy. There was nothing wrong with her.’ We had spent five years trying to conceive and when I went for my dating scan, they put my due date back by 18 days and said that my due date was 18 days later than I initially thought. But that wasn’t possible because that would have meant I would have gotten pregnant after I got the positive pregnancy test. So I fought them on that throughout the pregnancy and the conversations I had with various doctors were often very condescending. I had one doctor sit me down at six months pregnant to tell me how babies were made. Until the very end when they scanned me again, by which point I was a week overdue. And they scanned and she was measuring 43 weeks and three days. She had barely any fluid left. And then all of sudden they were saying this baby’s overdue and I was induced. Then, all of a sudden Hannah crowned. She was born in shock and needed to be resuscitated at birth. So for the first year and a half of her life I kept fighting to say there’s something not right here, there’s something going on. She still couldn’t hold her head up at six months old. She was a very floppy baby. She had a very high pitched cry and looked quite syndromatic. She was very refluxy and just nobody was listening. We kept taking her to our health visitor and I asked her if there were any milestones I should be looking out for. She said no, not really. I know now that there were certain things that I should be looking out for, but at the same time I was a first-time mother as well, and I was trying to work it out. I also had a lot of trauma associated with her birth and not being listened to. So I’d sought counselling and I thought all her problems were my fault. That perhaps these issues were caused by a lack of oxygen during birth. How did you finally reach a diagnosis? When she was 13 months old she had her first seizure. She had two seizures within twelve hours of each other. I insisted that we see a neurologist who again said there was nothing wrong with her. Then, when she was 18 months old, we spent time in Ireland with my family. And my brother has a little girl who is six months younger than Hannah. And all of a sudden seeing the two of them side by side it was really, really obvious that there was absolutely something going on. And so we came home and we registered with a new GP surgery and health visitor and had some fresh eyes. The health visitor came out and within minutes of meeting Hannah, she just said, ‘I believe you’. That was a huge moment for me because somebody else could see it, and it’s really difficult to advocate for your child and say I think there’s something wrong. And then when you don’t get heard and don’t get listened to it’s really hard to keep going. And that’s what it felt like. It was constant: ‘It’s all in your head; don’t compare her to other children.’ And then this woman sat down and finally said ‘I believe you’. Instead of doing the MRI first of all to confirm cerebral palsy, the first line is to test for genetic conditions. We were a bit blindsided by it. We hadn’t considered that it might be something genetic. We got the diagnosis over the phone. It was a mixture of relief that I wasn’t neurotic or crazy. I’d been right. I’d pushed and pushed and pushed and trusted my gut and I was right. But there was also that unknown of having such a rare condition and knowing that she might need lifelong support. How did these events affect the relationship you had with doctors and healthcare professionals? I was really angry. A doctor once asked me, would she grow out of it. And I said ‘no, in the same way you wouldn’t grow out of Down syndrome.’ That was the point I realised I needed to become the expert in this condition. This is what it means and this is what it means for her. Not long after her diagnosis she came down with a viral infection. I took her to six GPs over the course of ten days who kept telling me that it’s viral and to treat her at home with calpol and ibuprofen. On day ten, I said enough is enough. I wanted a letter from a local GP to go up to a local children’s hospital. I wanted a review from someone more senior. They said clinically she’s fine but if it would make [me] feel better, they would get her reviewed at the hospital. It wasn’t about making me feel better but making sure that Hannah was alright. We got to the hospital, and we’d only been there ten minutes and she started to seize. She seized for 30 minutes, and spent five days on life support. We were later told that had we not been at the hospital when that happened, she would have died. The paramedics wouldn’t have got to her in time to ventilate her. It made me realise that had I been listened to, we could have avoided not only the emotional nightmare but also the financial cost. The cost of a round of antibiotics is significantly less than a five day run on an intensive care unit. It was really after that that I started to assert myself more. What advice might you give to someone whose child has just been diagnosed with a rare disease?